When my girls were young, we had muffins on a regular basis - several times a week. I don't make them as much now that they are grown and have their own homes, but they are still a favorite. 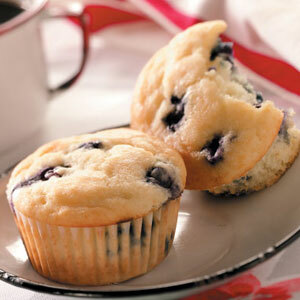 This recipe makes a moist and flavorful muffin. In a small bowl, combine the flour, sugar, salt, baking powder and baking soda. In another bowl, combine the egg, yogurt, oil and milk. Stir into dry ingredients just until moistened. Fold in blueberries. Fill greased or paper-lined muffin cups three-fourths full. Bake at 350° for 20-22 minutes or until a toothpick inserted near the center comes out clean. Cool for 5 minutes before removing from pan to a wire rack. Serve warm. Yield: 6 muffins.